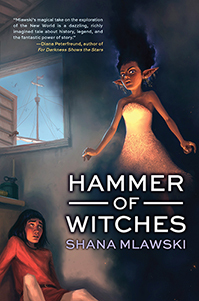 Hammer of Witches, by Shana Mlawski (book review) – sorcery aboard Columbus’ ships! with sorcerers and an Inquisition agent aboard? Why not? The Inquisition sought out magicians and Marranos, Protestants and Moors, anyone who might challenge the rule of the monarchy and Catholic Church in Spain during the 1400s. Perhaps Baltasar inherited his ability to sense sorcery and call up magical creatures from his late parents. Perhaps close proximity to all those mystical books recopied and bound by his uncle did it. Good thing he has such magical skill… unless it gets him killed by superstitious sailors before he can save them from supernatural adversaries! Read the first two chapters of Hammer of Witches here, then head for your local library or independent bookstore to get the rest of Baltasar’s story. Could you sacrifice so much to rescue those who despise you? My book talk: Uncle always said there was magic in a story, and Baltasar thought his stories were the most magical thing in their sleepy Spanish town. When true magic erupts from their stories and the Inquisition attacks their home, the young man escapes by sea, taking his worries and magic aboard the ships of Christopher Columbus. Perhaps it began with Uncle’s bedtime stories about the hero al-Katib fighting against his own Moorish people to save Spain for Christianity, or maybe when he told a darker tale about men who killed their brother who avenged himself from the grave, or perhaps it was the story never fully told about how Bali’s mother and father died, leaving him as a child with his aunt and uncle – for there truly is magic in Uncle’s stories. In these days of 1492, the Inquisition is intent on ridding Spain of magicians, heretics, Jews, and the last of the Moors who had held their land for so many years. Why should they attack Uncle’s humble bookmaking workshop? Were those dark eyes staring through Bali’s window last night something of the Devil? How did Baltasar summon the golem that liberated him from the Inquisition dungeon? But the magic is aboard ship, too, as is an agent of the Inquisition! The expedition commander is a religious man, bound for glory and gold and spreading the Church. What will Columbus do when he discovers that Baltasar must be a sorcerer? As a supernatural sea monster tries to stop the voyage, Bali’s skills come into play, but even larger dangers loom ahead on the land just sighted. What will happen when New World and Old World supernatural forces collide? Is the other magic he can sense aboard ship for good or for evil? When will the Inquistion agent become the dreaded “hammer of witches” against Bali? The familiar story of Columbus’ first voyage takes a novel turn as the magic and sorcery long hunted by the Inquisition but never found in our world becomes a vital factor in the survival of the crew, the native peoples, and Baltasar himself as he seeks his hero al-Katib to vanquish evil. (One of 6,000 books recommended on www.abookandahug.com) Review copy and cover image courtesy of the publisher.